When managing complex projects from start to finish, the ability to make real-time adjustments to project scope, resource availability, and overall project and resource margins is important. Use Anaplan’s project planning software to view summary-level project portfolio data and visualizations, then drill down to manage projects at the task level. Watch this video to learn how Anaplan helps users to not only manage projects at the task level, but also make changes to projects on-the-fly as drivers and conditions change in order to see real-time impacts on resource availability and margins. Anaplan for Project Planning provides you with a blueprint for your project planning needs, modeled after best practices that you can easily modify to meet your specific process flows and drivers. Use a library of KPIs, or build your own, to test and identify activity metrics and available resources for predicting your project completion. Heat maps key in on resource availability and margin variances for each milestone. Easily modify your project plan as necessary—adding, deleting, or editing milestones and tasks—with the flexibility of project planning software powered by Anaplan. View your project portfolio for summary statistics, with heat map indicators for resource status and margin variance. Drill down to the category and task level. See overall project status over a time horizon. 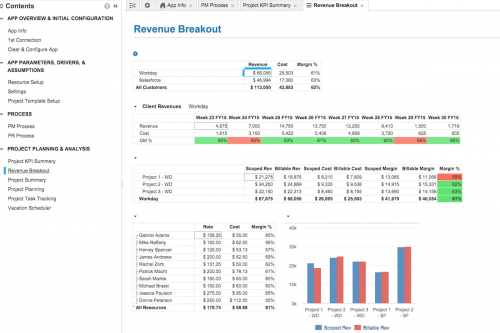 From your Revenue Breakout dashboard, view revenue, cost, and gross margin by project. For each project, drill down to a detailed view of the project’s people resources. 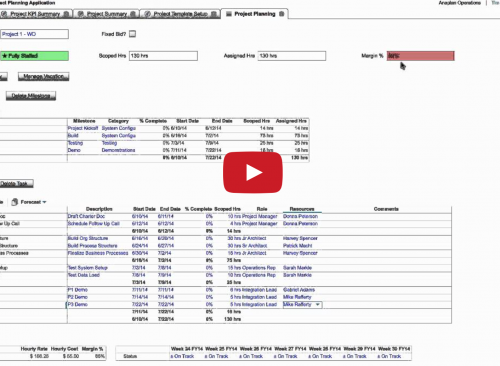 Why Anaplan for Project Planning? Start with a blueprint for your project planning needs, modeled after best practices that you can easily modify to meet your specific process flows and drivers. Manage your project from start to finish, with real-time adjustments on project scope, project milestones and tasks, and project resource margins. Use a library of KPIs, or build your own, to test and identify activity metrics and available resources for predicting your project completion. Anaplan’s project planning software offers you the ability to apply an unlimited number of driver-based “what-if” scenarios to model, for example, resource capacity plans, the impact of availability constraints, by skill set and experience, or other drivers. 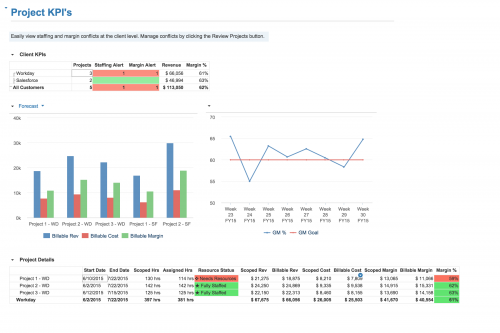 View and manage project services bench for availability of resources by role, billable rate, and associated margin percentage. 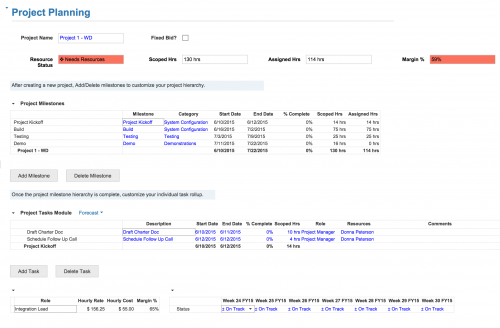 View each resource across multiple clients and multiple projects to identify conflicts in availability. Start with a blueprint for your project planning needs, modeled after best practices that you can easily modify to meet your specific process flows and drivers. 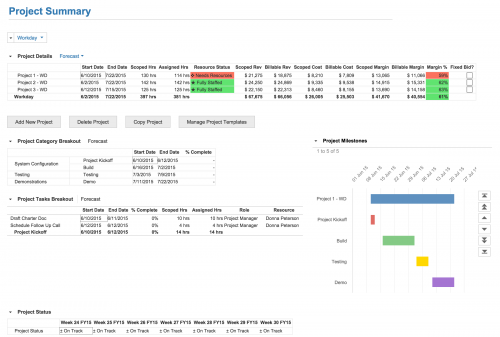 Manage your project from start to finish, with real-time adjustments on project scope, project milestones and tasks, and project resource margins.Use a library of KPIs, or build your own, to test and identify activity metrics and available resources for predicting your project completion. Anaplan’s project planning software offers you the ability to apply an unlimited number of driver-based “what-if” scenarios to model, for example, resource capacity plans, the impact of availability constraints, by skill set and experience, or other drivers.